Amanda (center in the picture), Cleyde (left in picture), and Ian (right in picture) are three former life science postdocs who left academia between 2015 and 2017. When transitioning, they felt isolated from their peer groups who were predominantly academics. They found each other on Twitter seeking advice and got to talk about the challenges one faces when switching careers. So they decided to start the Recovering Academic podcast, which just entered its third season. There is a lot of information about how to write a resume and other more technical advise. The Recovering Academic podcast shares experiences with these practical issues. They speak, for example, about networking and resume writing in their episodes. But what really brought them together was the emotional struggle of leaving the Ivory Tower. So they speak with their guests about the experience of leaving, the reactions of academic peers. The feelings of failure. This is a “crossover” episode of Recovering Academic and Science for Societal Progress. 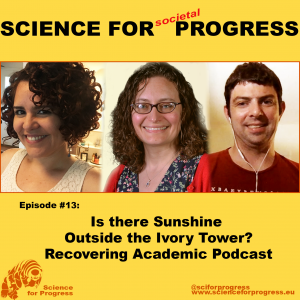 Besides talking about how Amanda, Cleyde and Ian met and why they decided to create Recovering Academic, I wanted to know what they themselves learned from doing the podcast, and which episode they liked the most. We talked about my story, too, which you can listen to in their version of this episode.